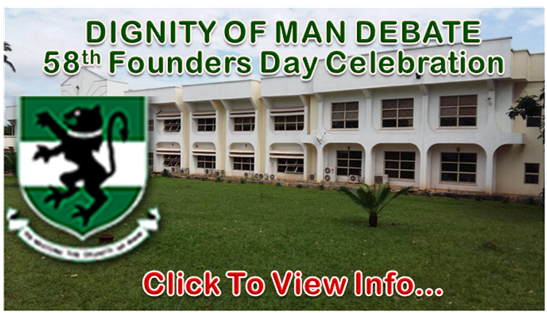 Dignity of Man Debate is an annual Debate Championship in commemoration of the University of Nigeria Founders’ Day. The Debate is based on the British Parliamentary system. It is aimed at promoting critical thinking, advocacy and public speaking skills among our students. Applications are hereby invited from students of the University of Nigeria who may wish to participate in the Debate. Constitute themselves into teams, and apply as such. Each team shall comprise two persons. The Department, Registration number and phone numbers of team members should be indicated. Entries for the debate are to be sent to onochie.agudosi@unn.edu.ng before Friday, 31st August, 2018.